Sweet raisin buns was one of my favorites in childhood days.Many of you might have also been crazy about these sweet pillow buns from the local bakeries in Kerala.There was a second variation of this same recipe with tutty fruity on top instead of raisins too.You can use either of the two.This was a long time wished and tried recipe to recreate the same tastes.A cup of tea or coffee is good enough to dip and gobble too but I personally like to eat it just like that.If you're missing these soft buns then do give this a try & enjoy !! Sift the flour,sugar(reserve 1 tsp) and salt in a bowl.Mix well,keep aside. In the dough mixture,add the frothy yeast mixture and then add the milk.Add in the reserved egg yolk and knead.Add the butter at the end to get a smooth yet sticky dough.Knead for 5-6 mins. Oil a bowl and leave to rise.Oil the top of the dough too,keep the dough covered for 1 hour. 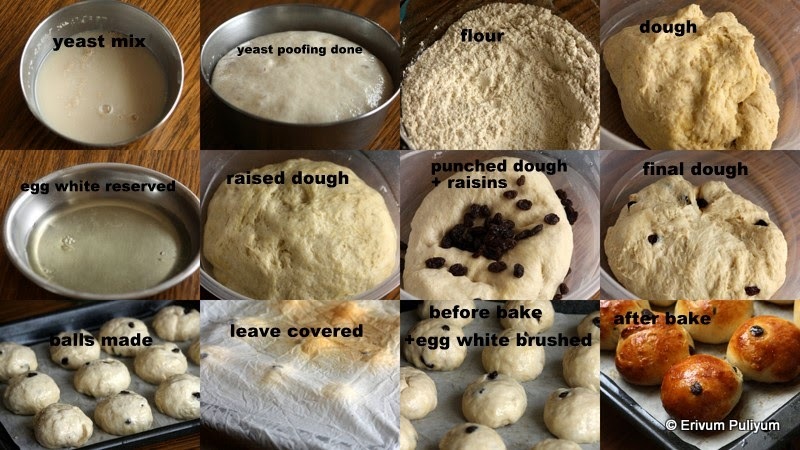 After an hour,you will find the dough doubled in size.Punch out the air and thenadd raisins,mix well. Make equal portions(about 12-16 balls).Now re roll each ball and make it to get a somewhat smooth surface. Preheat oven to 400 degrees F and then line a tray with parchment paper. Brush the top with beaten egg wash(reserved) or butter liberally. (gives the golden brown).Leave covered with a damp towel for 15 more minutes to rise.Then brush again with remaining egg white and then place in pre heated oven for 10-15 minutes(mine got done only by 15 -16 mins). Cool on wire rack and enjoy with milk or tea !! * The dough should be sticky and not smooth when left to rise. * The yeast should be mixed in leuk warm water and not boiling water.If you get wrong here,then the whole recipe will not work good.Adding boiling water will only kill the yeast.Preferably use water as a medium to mix yeast,gives best results. * Add the butter or oil towards the end of making dough. * Keep the dough covered to rise or use a damp towel to cover. *Oil the bowl and the top of the dough to prevent sticking and drying up. *Adding egg just adds taste and flavor to the recipe.Omit if you wish an eggless one,use milk instead for the same quantity. *You can use butter or oil,both works fine. * Don't forget to use egg wash or milk or butter on the top to get a golden brown crust. * After bake,always brush the top immediately with butter,gives a soft crust on top. * Use the same recipe to make hamburger buns if you wish,reduce sugar to 2tsp and sprinkle sesame seeds on top. nice buns. Would make a nice snack! Send me a dozen, sure we'll love them. Yum! These are my favorite. I make them with stuffing coconut,nuts & raisins too. A perfect tea time snack!! I can smell those buns here! Mmmm! I want it warm with a glass of milk on the side. looks very perfect , must try. Wish this bakery was somewhere near by!Such pretty buns Julie, u have a special way of waking my nostalgia. Thanks Pavithra for the feedback...Am happy the buns turned out perfect.Happy baking !! Wonderful recipe. Tried it number of times, handmade. I have now bought a Kitchenaid Stand Mixer. Would the procedure remain the same ? Kindly let me know if you can. NR G: Thanks for the comment..yes, the procedure remains the same whether hand made or stand mixer. Combine the yeast mixture, flour , egg,melted butter and milk in the bowl and then run on low speed for 7-8 mins.